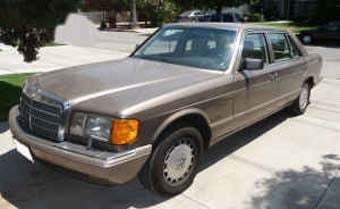 Nice Price Or Crack Pipe: $15,500 For A 1989 Mercedes-Benz 420SEL? Nice Price Or Crack Pipe Time is with us once more, following up on the $15,000 '78 Mercury Grand Marquis (which 60% of you felt ought to steam straight to Booth Numbah Two for the crack pipe) with another car for 15 grand. Actually, this '89 420SEL is 15 and a half grand, which is quite an impressive figure… especially after you find out that Kelley thinks it's worth $4,675 in excellent condition. But hey, this car is really, really nice; low miles, looks good, and the owner has "neither smoked nor allowed any pets in the car." What do you think of $15,500 for it? [Craigslist Los Angeles], Thanks to Commodore356 for the tip! What would you say to $15,500 for an '89 420SEL?